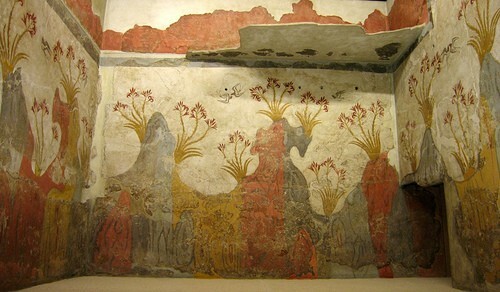 The existence of archeological findings in Acrotiri proves that before the explosion, there was a developed and probably aristocratic life in Santorini, a fact confirming the human presence on the island before the Bronze Age. In the meanwhile, the great excavation of Acrotiri certifies that in the following period as well, in mid Cycladic period (2000-1550 B.C.) human activity of the island did not stop since it was expanded and gradually developed to one of the most important city centers and ports in the mid and towards the end of the Bronze Age (20th-17th century B.C.). 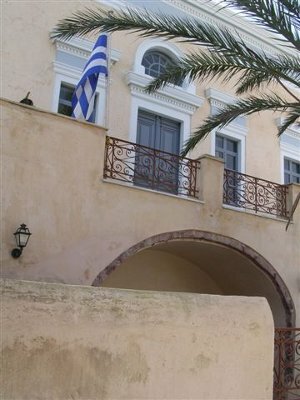 Furthermore, the several imported items found in the buildings witness the vast net of the island’s external relations. In fact, Acrotiri was in contact with Crete while it communicated with Greek continent, the Dodecanese, Cyprus, Syria and Egypt. 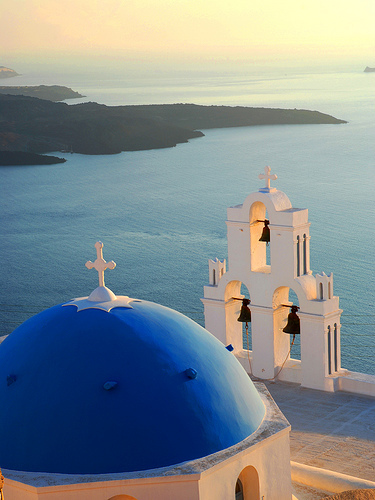 Over the 2nd millennium B.C., a volcanic eruption takes place in Santorini sweeping to the bottom of the sea a whole island along with its civilization and human values. References made by Herodotus in his Premature History mention that the island was called Strogyli, because of its circular shape. 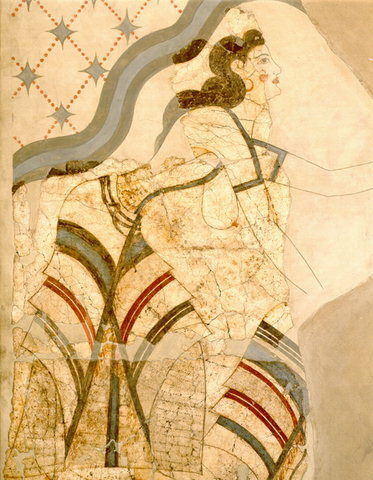 Around 1330 B.C., Phoenicians settled for five generations to come in Thira, led by Cadmos. Later, the island became a colony of Spartans and after their leader Thiras, son of Aftesionas, Thira was named. 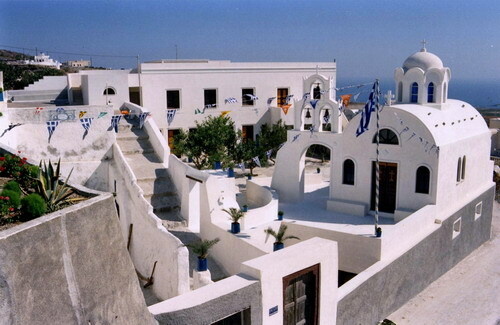 Later on, during the 9th century B.C., Thira becomes one of the most important stations bridging East with West. Actually, in the end of the 8th and the beginning of the 7th century B.C., the Phoenician alphabet was imported in Thira, Crete, Milos and so Greek language was created. However, it is noteworthy that Alexios Komninos (1081-1118 A.D.) founded the church of Bishop Mary in Gonia, most probably as a Catholic Monastery. In the meanwhile, since Byzantine years, the biggest problem of the Aegean islands was the pirates who unimpeded captured the coasts imposing taxes and looting. Owing to this, the habitants of the island in order to protect themselves from the invaders had built their villages “Castellia”(Castles), to which they would seek shelter, even the slaves, when the alarm sign was heard. The existence of five such castles is mentioned since the years of Franks. After the Fall of Constantinople by the crusaders of the fourth Crusade (1204) and the creation of the Latin Empire of Bosporus, Dandolo granted those islands to his nephew, Mark Sanoudo. So, the Ducat of Naxos or Archipelago was created. Thira became the throne of one of the four Latin Bishops of the Ducat and together with Thirasia, it was given as baronship to Iakov Varotsi. 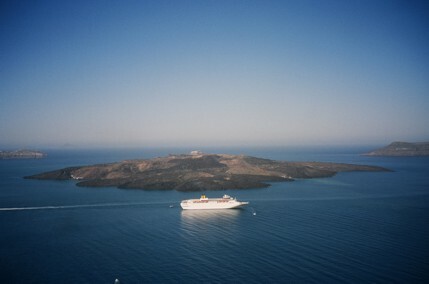 Until 1296, the island was under the command of five generations of the Varotsi family, who used the pompous title “Despotad of the islands Thira and Thirasia”. 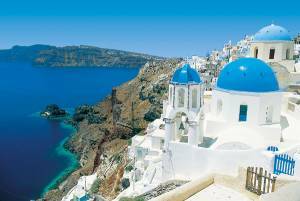 Over the years of Frank possession (1207-1579), Santorini followed the destiny and history of the remaining islands of the Ducat of Naxos. 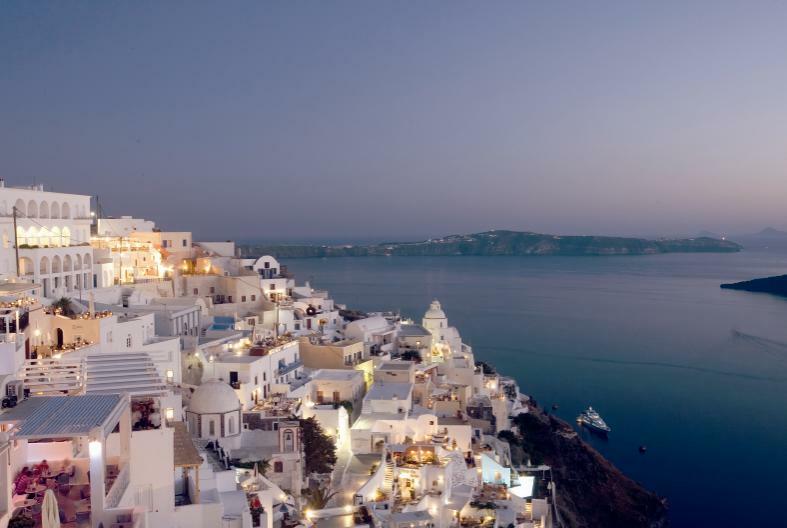 In Santorini, you will find local dishes such as fava and sweets like melitinia. In Santorini, you can find many paths and stone paved alleys, many of which have started being restored to keep their traditional appearance. Paved with volcanic stones of the island, make the familiar shape of the snake to cope with the hurricanes and take the sightseer to every destination he would like to reach. Additionally, the visitors, besides the museums and the beaches, can visit the site of the volcano.